Four years have passed since the last time we dealt with the discography of Magnanimus Trio. And now here comes the newest album (and third overall) of this very special (should we call it jazz?) Trio, which comes from Thessaloniki and AN Music. As we wrote, four years ago: “Magnanimus Trio was created by three friends, Christos Barbas on piano, kaval and vocals, Dimitris Tasoudis on drums and piano and Pavlos Spyropoulos on double bass in September of 2010. They met already back in the late 90s, when they were fellow students at the Music Department of the School of Fine Arts of the Aristotle University of Thessaloniki. Each following his own way, they met again and combined their varied and equally interesting musical journeys and professional occupations.” Updating this earlier note; we add that in their 3rd album Barbas plays also the ney and Tasoudis the kalimba. 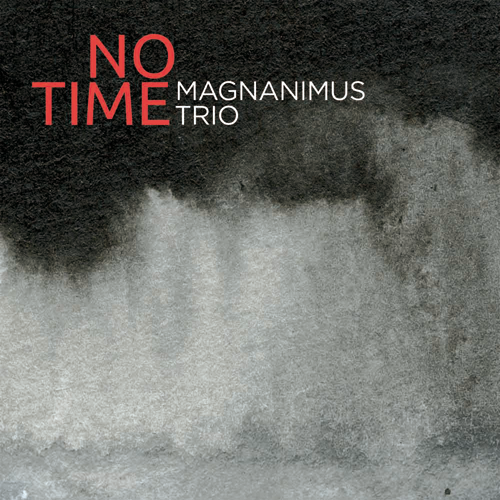 In “No Time” Magnanimus Trio continue, I would say, from where they stopped with “Still Time”, in 2012. The group continues to adapt its aesthetic pursuits on a framework defined by tradition, jazz and avant-garde – though, in this album, not with the same ratio. I mean that in “No Time” jazz seems to acquire a primacy with regard to the final sound structure – although in this case, again, we have to add an “asterisk” (to insert a footnote). Mainly because Magnanimus Trio does not sound like a typical American post-bop or contemporary group, but as a group of our wider region (Eastern Mediterranean let’s say), having assimilated different improvisation techniques (always in relation with the modal melodies), performing with confidence. And even singing; judging by the fragile performance of a sonnet by Shakespeare, and one more song with lyrics by Christos Barbas. This uniqueness, let’s say, is evident primarily in the group’s compositions, which in their simplicity appear balanced and most of all complete. I mean that it is not easy to meet elsewhere the sound of Magnanimus Trio. Maybe because many European trios do not invest in modality, resorting to most relevant for them “romances”, or maybe because in other “advanced” (European or American) groups the avant complexity does not leave much room for emotional expression – the truth is this. Even though the so-called “globalization” has created an aesthetic leveling –which, many times, does not allow you to realize if what reaches your ears has roots hidden somewhere deep inside–, there will always be a counterweight. And the Eastern Mediterranean is a region of the world that still produces such counterweights – even though this does not appeal to some.